For the Australian footballer, see Dale Evans (footballer). For the American football player and coach, see Dale Evans (American football). Dale Evans was born Lucille Wood Smith on October 31, 1912 in Uvalde, Texas, the daughter of T. Hillman Smith and Bettie Sue Wood. She had a tumultuous early life. Her name was changed to Frances Octavia Smith while she was still an infant. She spent a lot of time living with her uncle, Dr. L.D. Massey, a general practice physician, in Osceola, Arkansas. At age 14, she eloped with and married Thomas F. Fox, with whom she had one son, Thomas F. Fox, Jr., when she was 15. A year later, abandoned by her husband, she found herself in Memphis, Tennessee, a single parent, pursuing a career in music. She landed a job with local radio stations (WMC and WREC), singing and playing piano. Divorced in 1929, she took the name Dale Evans in the early 1930s to promote her singing career. Throughout this early period, Evans went through two additional failed marriages, the first of which was to August Wayne Johns from 1929 to 1935. In 1937, she married her third husband, accompanist and arranger Robert Dale Butts; they divorced nine years later. Neither of these marriages produced any children. During her time at 20th Century Fox, the studio promoted her as the unmarried supporter of her teenage "brother" Tommy (actually her son Tom Fox, Jr.). This deception continued through her divorce from Butts in 1946 and her development as a cowgirl co-star to Roy Rogers at Republic Studios. 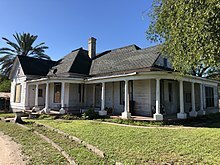 Evans married Roy Rogers on New Year's Eve 1947 at the Flying L Ranch in Davis, Oklahoma, where they had earlier filmed the movie Home in Oklahoma. The marriage was Rogers' third and Evans' fourth but was successful; the two were a team on- and off-screen from 1946 until Rogers' death in 1998. Shortly after the wedding, Evans ended the deception regarding her son, Tommy. Roy had an adopted child, Cheryl, and two biological children, Linda and Roy (Dusty) Jr., from his second marriage. Together they had one child, Robin Elizabeth, who died of complications of Down syndrome shortly before her second birthday. Her life inspired Evans to write her bestseller Angel Unaware. Evans was very influential in changing public perceptions of children with developmental disabilities and served as a role model for many parents. After she wrote Angel Unaware, a group then known as the “Oklahoma County Council for Mentally Retarded Children” adopted its better-known name Dale Rogers Training Center in her honor. Evans went on to write a number of religious and inspirational books. Roy and Dale appeared many times with Billy Graham in Crusades all over the country, singing gospel songs and giving their testimony. Evans and Rogers adopted four other children: Mimi, Dodie, Sandy, and Debbie. From 1951-57, Evans and Rogers starred in the highly successful television series The Roy Rogers Show, in which they continued their cowboy and cowgirl roles, with her riding her trusty buckskin horse, Buttermilk. Alice Van-Springsteen served as a double for both Evans and Gail Davis, the actress who starred in the syndicated series Annie Oakley, often performing such tasks as tipping over wagons and jumping railroad tracks. In addition to her successful TV shows, more than 30 films and some 200 songs, Evans wrote the well-known song "Happy Trails". In later episodes of the program, she was outspoken in her Christianity, telling people that God would assist them with their troubles and imploring adults and children to turn to Him for guidance. 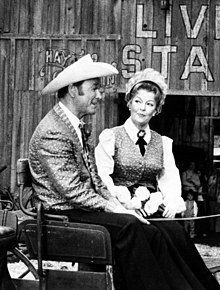 In late 1962, the couple co-hosted a comedy-western-variety program, The Roy Rogers and Dale Evans Show, which aired on ABC. It was canceled after three months, losing in the ratings to the first season of The Jackie Gleason Show. In 1964, Evans spoke at a "Project Prayer" rally attended by 2,500 at the Shrine Auditorium in Los Angeles. The gathering, which was hosted by actor Anthony Eisley, star of ABC's Hawaiian Eye series, sought to flood the United States Congress with letters in support of mandatory school prayer, following two decisions in 1962 and 1963 of the United States Supreme Court which struck down mandatory prayer as conflicting with the Establishment Clause of the First Amendment to the United States Constitution. Joining Evans and Eisley at the Project Prayer rally were Walter Brennan, Lloyd Nolan, Rhonda Fleming, Pat Boone, and Gloria Swanson. Evans declared, "It's high time that all America stood up to be counted. Let our children learn of the Lord and be free." Eisely and Fleming added that Rogers, John Wayne, Ronald Reagan, Mary Pickford, Jane Russell, Ginger Rogers, and Pat Buttram would have attended the rally had their schedules permitted. In the 1970s, Evans recorded several solo albums of religious music. During the 1980s, the couple introduced their films weekly on the former The Nashville Network. In the 1990s, Evans hosted her own religious television program. Evans died of congestive heart failure on February 7, 2001, at the age of 88, in Apple Valley, California. She is interred at Sunset Hills Memorial Park in Apple Valley, next to Rogers. For her contribution to radio, Dale Evans has a star on the Hollywood Walk of Fame at 6638 Hollywood Blvd. She received a second star at 1737 Vine St. for her contribution to the television industry. In 1976, she was inducted into the Western Performers Hall of Fame at the National Cowboy & Western Heritage Museum in Oklahoma City, Oklahoma. In 1995, she was inducted into the National Cowgirl Museum and Hall of Fame in Fort Worth, Texas. In 1997, she was inducted into the Texas Trail of Fame. She ranked No. 34 on CMT's 40 Greatest Women in Country Music in 2002. 'Cowgirl' is an attitude really. A pioneer spirit, a special American brand of courage. The cowgirl faces life head-on, lives by her own lights, and makes no excuses. Cowgirls take stands; they speak up. They defend things they hold dear. ^ Miller Davis, Elise (1955). The Answer is God (First ed.). New York: McGraw-Hill Book Co. pp. 59–62. LCCN 55009539. 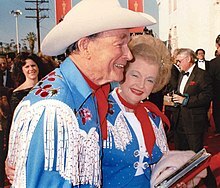 ^ Dale Evans' biography, royrogers.com; accessed May 16, 2014. ^ a b "Dale Evans Biography". The Roy Rogers – Dale Evans Museum. Retrieved 2008-02-05. ^ Staff (July 7, 1998). "Roy Rogers, 'King of the Cowboys' Dies". Los Angeles Times. ^ a b Drew Pearson (May 14, 1964). "The Washington Merry-Go-Round" (PDF). dspace.wrlc.org. Archived from the original (PDF) on January 16, 2013. Retrieved January 13, 2013. ^ Brooks, Patricia; Brooks, Jonathan (2006). "Chapter 8: East L.A. and the Desert". Laid to Rest in California: a guide to the cemeteries and grave sites of the rich and famous. Guilford, CT: Globe Pequot Press. pp. 235–37. ISBN 978-0762741014. OCLC 70284362. ^ "Great Western Performers - National Cowboy & Western Heritage Museum". National Cowboy & Western Heritage Museum. Retrieved 13 May 2017. ^ "Dale Evans - Cowgirl Hall of Fame & Museum". Cowgirl Hall of Fame & Museum. Retrieved 13 May 2017. ^ "Dale Evans". Western Heritage from the Texas Trail of Fame. 2013-05-24. Retrieved 13 May 2017. ^ Dale Evans profile, cowgirl.com; accessed February 25, 2015. ^ Palm Springs Walk of Stars (by date of dedication); accessed May 16, 2014. Zwisohn, Laurence. (1998). "Dale Evans". In The Encyclopedia of Country Music. Paul Kingsbury, Editor. New York: Oxford University Press. pp. 166–7.